Where did you grow up, and how do you think that shaped you? I was born and raised in Sioux Falls, SD. I think growing up in a big city that feels like a small town really taught me the value of people and finding community with one another. I grew up in a wonderful Jesus-loving home with family members I truly do not deserve. The family I have and the city I grew up in allowed me to find beauty in small places, seek joy in the difficult seasons, and find God in every single human I encounter. One day, my dream is to be...an author and a photographer. I would also love to do some sort of traveling, speaking to young girls, and sharing the love + goodness of Jesus I’ve been blessed to experience firsthand. Tell me about what you feel God speaking over your 2019. Do you have a word for the year, or how do you feel God is encouraging you for this upcoming year? I most definitely have a word I feel God is speaking over me this year and it is STRENGTH. Ever since I began college, anxiety and depression have been something I have struggled with constantly. Both have affected my everyday life along with sending my health into a downwards spiral. I’ve always lacked the strength I needed and could never see the light at the end of the tunnel — I thought of giving up several times. But God !!! He has brought me through over and over, and here I am in my final semester of college. HE is my strength and the only One I am capable of doing anything through! I currently have a key necklace around my neck with the word STRENGTH to remind me of these very things. He is TOO good !! 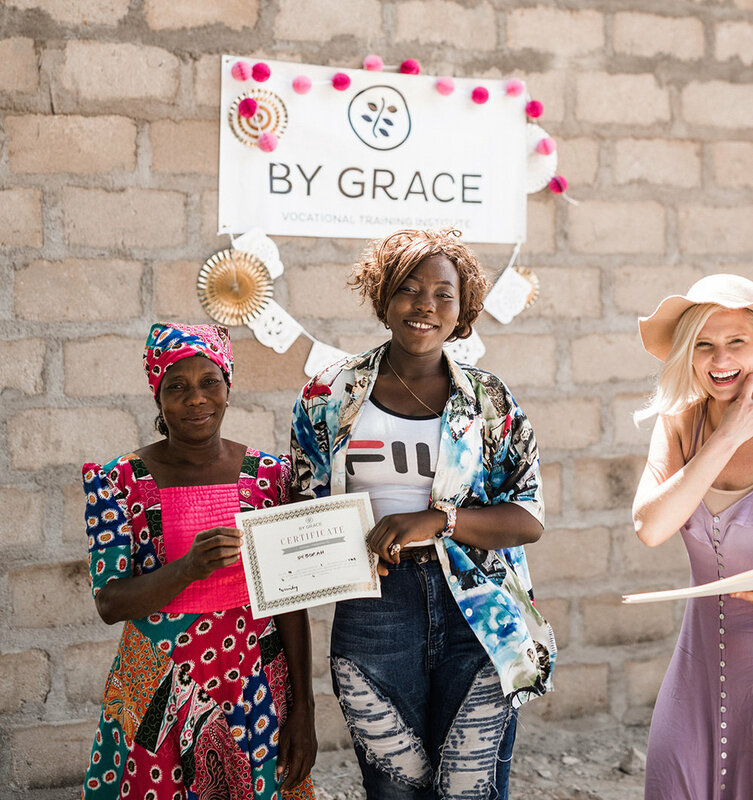 I’m interning with By Grace because...I absolutely love their mission in partnering with women from all over the world not only to create, but also getting to build relationships with those very women. What an honorable thing to be apart of in which I get to experience a front row seat to it all and even get the ability to serve alongside such a wonderful organization. Tell me about a time where a friend did something or showed love to you in an impactful way. A time a friend has showed love towards me would definitely be the past three and a half years living with my college roommate. Her name is Emily and she has showed more grace, love and patience towards me in my anxious to the brim moments than I knew was possible. She always pointed me back to relying on God and I needed that more than I realized. 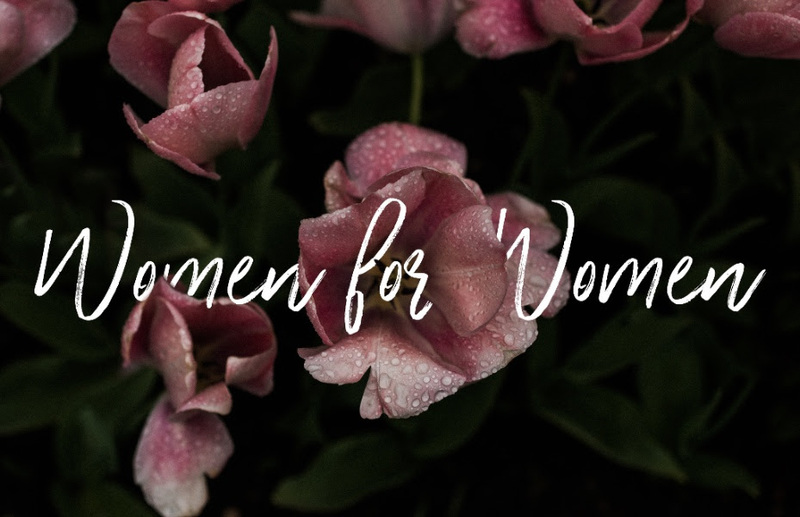 What does "women for women" mean to you? For me it means uniting together with women while approaching them (and life) with a love so radical, so deep, and so reflective of the great love God has for us. I think it means serving, laughing and crying with one another, side by side. As we reflect upon 2018, we are filled with gratitude! Your support has propelled our mission and programs to partner with and serve more than 44 women this year. These women are capable, talented individuals, coming from backgrounds that afforded them little support, training or resources for success. With your help, By Grace is helping to elevate them above their current circumstances and out of generational poverty. We opened our first brick-and-mortar vocational training institute in Tamale, Ghana. In this building, we sponsored the training of 12 apprentices. 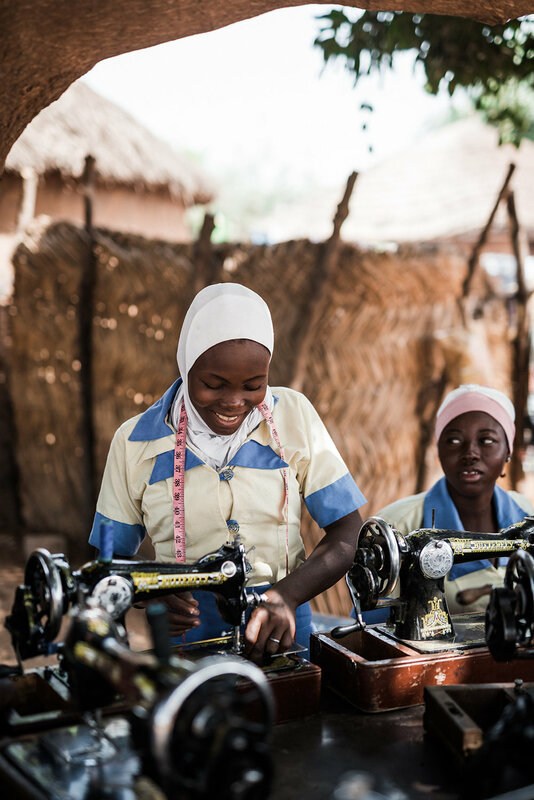 These young women, all coming from backgrounds of generational poverty, did not otherwise have the means to afford the training fees or sewing machine/supplies. Through a sponsored three-year training course that will equip them with the necessary skills, materials and certifications to succeed in the marketplace, they are becoming entrepreneurs and self-sufficient providers for themselves, their children and their families. We were awarded the Young Leaders of the Americas Reverse Exchange Grant. We mentored Nayleen Quintero, of Sante Cutarras, then partnered with her to launch our first workshop in Las Tablas, Panama. Here we taught two girls how to make cutarras (leather sandals), making them the first women trained in this ancient tradition. 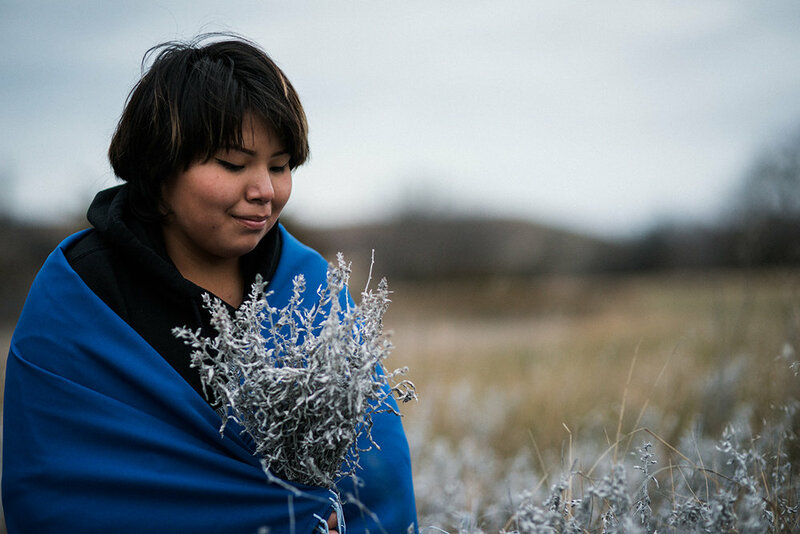 We worked with eight women on the Rosebud Native American Reservation, providing 1,000+ hours of employment that were completed in a safe environment and compensated with fair wages. 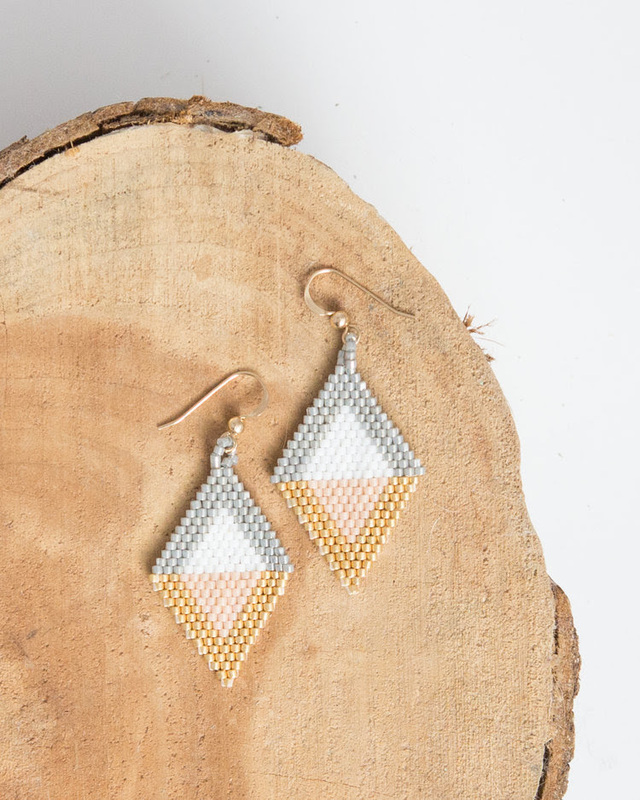 With the beautiful beading and handiwork of these artisans, we launched our most successful product line yet: the Rosebud Collection. 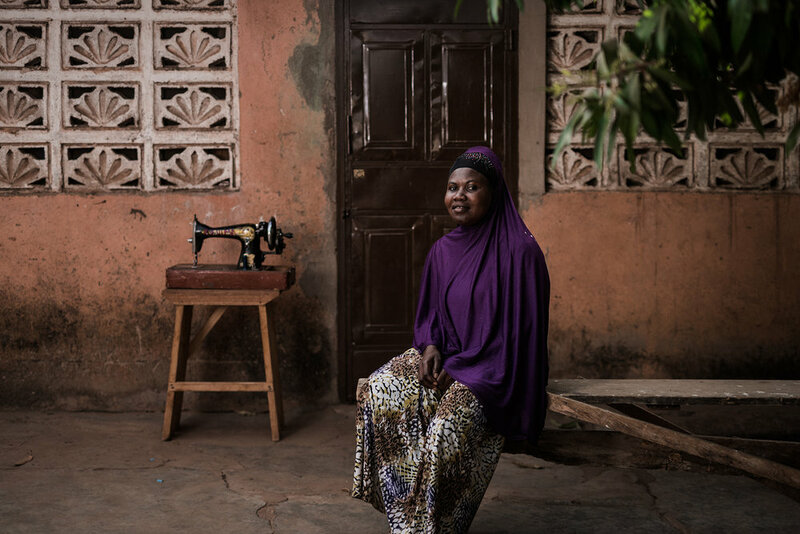 This allows us to continue reinvesting in the communities that inspired our sellable goods. We offered three paid internships and one-on-one mentorship to female college students in Kansas City and Los Angeles, helping to nurture the hearts and skill-sets of future entrepreneurs and change makers. Extraordinary things are happening every day at By Grace, and they wouldn’t be possible without you. Thank you for your support! By Grace supported one year of Deborah’s tuition fees as she studies Fashion Design Technology at Sunyani Technical University. We collaborated with some local female-founded businesses and incredible volunteers so that the hard-working moms of Amethyst Place could have a special night of free shopping. Each mom received a shopping bag filled with brand new items donated from local companies, while enjoying treats and having fun with the photo booth. Amethyst Place offers recovery housing and rehabilitation services for mothers undergoing a housing crisis and chronic substance abuse. They provide counseling, housing and practical resources for struggling moms to overcome addiction and re-enter the workforce. Hayley Santell, founder of MADI Apparel, and I became aware of the Amethyst Place mentorship program three years ago, and have been involved ever since. The mentorship program pairs volunteers with a mom in the Encompass program, and we meet twice a month to share a meal and talk about our lives. “Arms around you,” is the mission of the mentorship program. Ruby Paine said that the two ways to end poverty are: 1) education and 2) knowing someone that is not in poverty. Solving poverty can be so daunting - where do we even start? It’s effects are everywhere - down the street and around the world. The encouraging truth about Paine’s research is that the act of sharing a meal with someone, and establishing a relationship with him/her, is one of the most powerful ways to break the cycle of poverty. I’ve mentored a total of three women at Amethyst Place, and each woman I have felt so lucky - we have always had such great conversation and a deeper connection. I remember looking around the room at the mentors and their mentees deep in conversation. Surely, I thought, the director of Amethyst Place, Julie, took careful consideration into who she matched with who. Interested in participating in the next Women for Women event? Let us know below! Meet our newest intern: Elena Martinez! She’s 21 years old, and just graduated from San Diego State University with a degree in marketing. She has a passion for philanthropic pursuits and empowering women. She has been volunteering with By Grace for nearly two years, but now that she’s an integral part of our team, we wanted you to know a bit more about her with a little Q&A. A world traveler. I recently left the country for the first time! I went to Italy and never wanted to come back. I believe that the act of traveling opens your eyes to the world around you. It also provides perspective into the lives of others. I like the sense of adventure involved with traveling as well as the authentic food that you are able to experience and enjoy with each country you visit. When my older sister and I went to Disneyland. My sister lives out of state so we don’t see each other that often. It was fun spending quality time with her. Getting the chance to spend the whole day at Disneyland wasn’t too bad either! Chipotle. I could eat Chipotle EVERYDAY. As a high school graduation gift, my parents and I went to Las Vegas to see Britney Spears in concert. I was able to see my favorite singer perform along with spend time with my parents. I actually teared up a little bit when she first hit the stage. The whole trip was so much fun and as a family we created long lasting memories. I have always wanted to visit an island and experience an island culture. I love the beach and warm weather. Bora Bora seems like the ideal place for relaxation and opportunities for pure adventure. If one day I have the chance to visit Bora Bora, my dream is to stay in an over-water bungalow. Where is one place in the world you wish you lived? New York! I love the city vibe and the fast-paced lifestyle that New York offers. I adore the historic buildings in the heart of the city. I would also love to live in one of the fashion capitals of the world! My strong work ethic. I am dedicated to any task that lies in front of me. I am very driven, motivated, and I always try to perform to my fullest potential. Being comfortable in social situations. I was very shy growing up and this insecurity continued throughout high school. I really overcame this social self-doubt when I went away to college. I was able to find my voice and confidence. I overcame the fear of talking to others and was able to build lifelong friendships and meaningful relationships as a result. Life! I believe we should all live life to its fullest because we only get one chance at it! When I got accepted into a four-year university. It had always been a dream and a goal of mine. It was also proof that all of my hard work paid off. Do you have a role model? If so, who? Why? My mom. To me she defines strength and wisdom. She is selfless, understanding, courageous and fearless. She inspires me and motivates me every day. She is my best friend and I would be lost without her. I love the message behind the foundation. I love the fact that the priority is to empower women in impoverished countries. 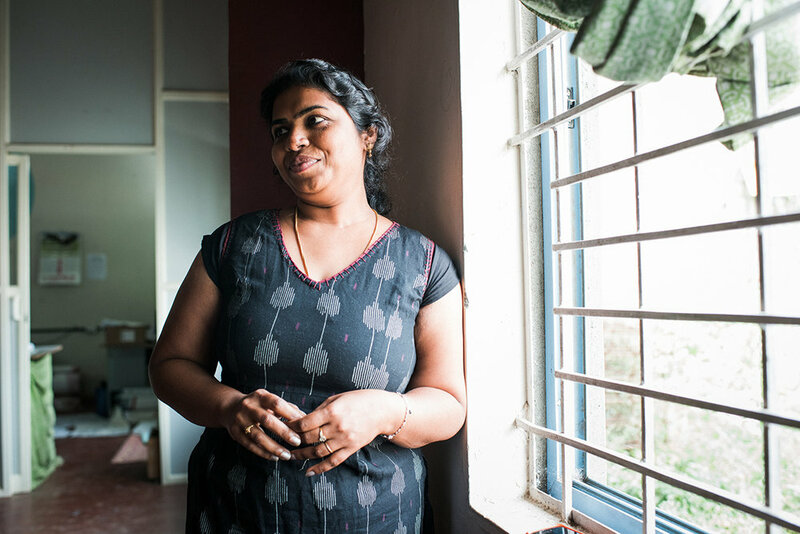 These deserving and hardworking women are earning an education in this craft. Also, the clothes and fabric are so beautiful and unique. The clothing and different pieces within the By Grace collection gives customers a taste of the Indian and African culture. Do you think it is possible for one person to make an impact? How so? I think it is possible for one person to make an impact. On a small-scale basis, one person can change the lives of others through simple and small acts of kindness. In terms of a larger scale impact, it only takes one person to influence countless numbers of people to follow that one person’s beliefs and goals to make the world a better place. We have witnessed this numerous times throughout history with a variety of dominant leaders such as Martin Luther King and Nelson Mandela. I would like to see people be more open to those that are different from them. Although our society has come a long way regarding this issue, there still remains many who choose to be closed minded. These intolerant individuals regard those that do not share similar backgrounds as them as inferior and non-deserving. As a society, we cannot judge people. Rather we need to be accepting towards others in order to be a prosperous society for years to come. What is the best way for women to support women? Women simply need to encourage other women’s success. Women should feel inspired by powerful and triumphant women. Often, the media magnifies the stigma of women bringing other women down. Women need to ignore this and not feed into these negative media messages. Relaxed, simple, practical, and casual. Levi’s, Kate Spade, H&M, Target, Hollister, Steve Madden, Urban Outfitters. Give your best style tip on how to wear a By Grace original. Simplicity is best! Let the By Grace pieces speak for themselves. Pair By Grace pieces with simple clothing and accessories to showcase the beauty of the prints. There you have it! A brief intro to our girl Elena! You’ll be reading more from her soon! Interested in applying for a paid internship with By Grace? Thanks to everyone who contributed! 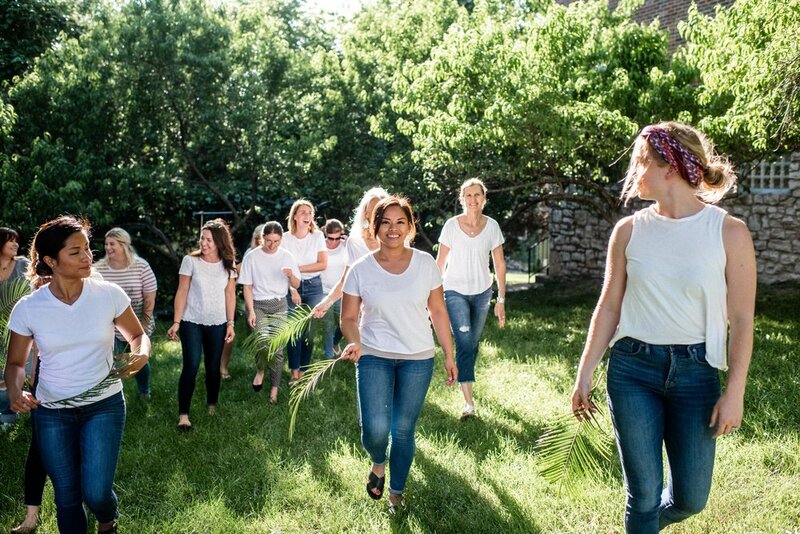 We hosted an event with MADI Apparel and Tara Shupe Photography to celebrate women at a local women's shelter in Kansas City. Women were able to shop for free, enjoy food and drinks, and have their picture taken in the photobooth. Thank you for empowering women in the U.S. and abroad! We are so excited to partner with a company that shares our mission to empower women across the world. Shop By Grace at Bought Beautifully! Think about your favorite spot in the house. Is it the corner next to the window? Or that chair by the fireplace? What if you didn't have a place to which you could retreat? 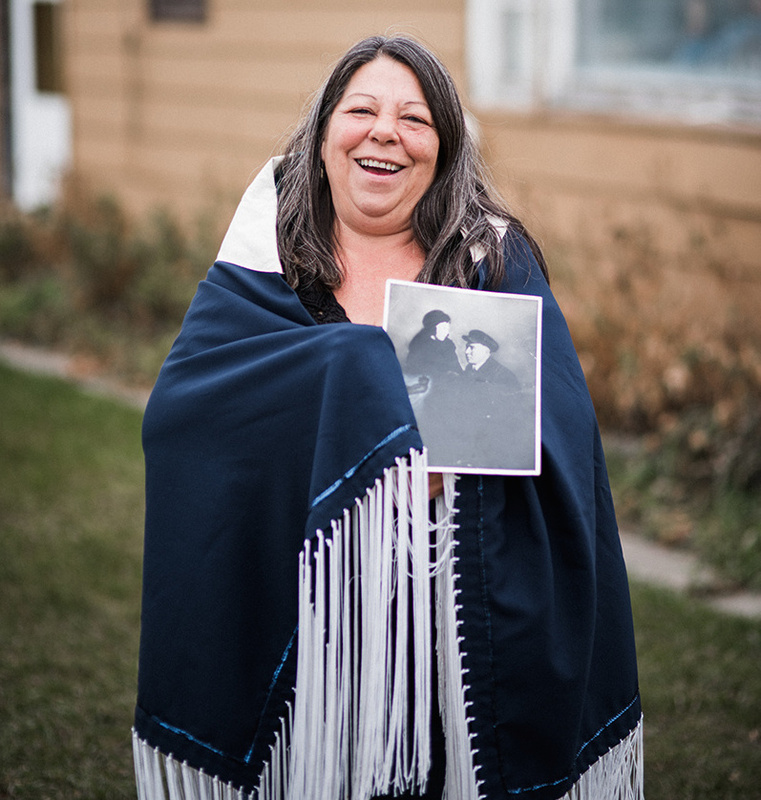 Learn about how we're using the principles from The Broken Windows Theory to regenerate and invigorate the Rosebud Reservation on the blog here. Shop with us at Coco Brookside! On Saturday, August 11, we'll host a pop-up shop at Coco Brookside. If you're in the KC area, come see us between 11 a.m. - 5 p.m.! Thank you to every By Grace donor and customer. Together, we're changing the world, one woman at a time.